This entry was posted on 25th November, 2009 by Haxnicks. Herbs All The Year Round! Herbs are really so easy to grow and if picked fresh add an extra special zest to food that can't be achieved with the dried varieties. The beauty of growing your own herbs is that you can keep a tray of parsley, mint, chervil, coriander, sage and thyme on your windowsill and you don't even have to go outside in the rain to pick what you need! One of the easiest ways to grow your herbs is to take a Compact Rapid Rootrainer tray, fill it with good multipurpose moist compost and sow your seeds into the cells, cover with the propagating lid and leave for about a fortnight to germinate. Once the seedlings begin to emerge the tray can then be placed on a windowsill where it gets adequate light and as the plants grow the lid can then be taken off and used as a drip tray. Remember that herbs do not tolerate north facing windows and prefer a window that get at least 4 hours of direct sunshine per day. Without a plentiful source of light most indoor herbs will slow down or even stop growing. If you find this happening you should reduce the picking of the herbs as well as reducing the watering. Make sure the indoor temperature is not in excess of 65 degrees until plant growth restarts. It must also be remembered that not every herb likes living indoors. Herbs like coriander, cress and dill are annuals which when harvested and cut need to be re-sown in order to produce a continuous crop. So it is a good idea to keep 3 trays of these herbs at different stages for a continuous supply. 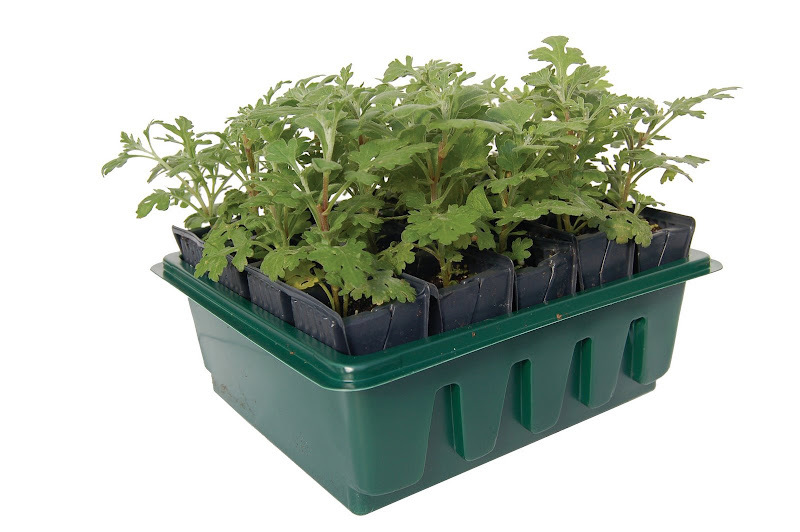 Herbs that are grown indoors should be clipped or have leaves picked regularly to encourage new growth and it must be remembered that potted herbs dry out more quickly than those in the open ground, although if you are using Rootrainers the structure of the cell encourages a maximization of all water to the roots. Herbs with large soft leaves such as basil need a fine spray to humidify the air on hot days. Indoor herbs should be fed every 2 weeks with a liquid fertilizer to help maintain vigorous growth. Hi there! I could have sworn I've been to this blog before but after reading through some of the post I realized it's new to me. Anyways, I'm definitely happy I found it and I'll be book-marking and checking back frequently! Hello, thanks for your comment and I am glad we are in your bookmarks. More coming soon!